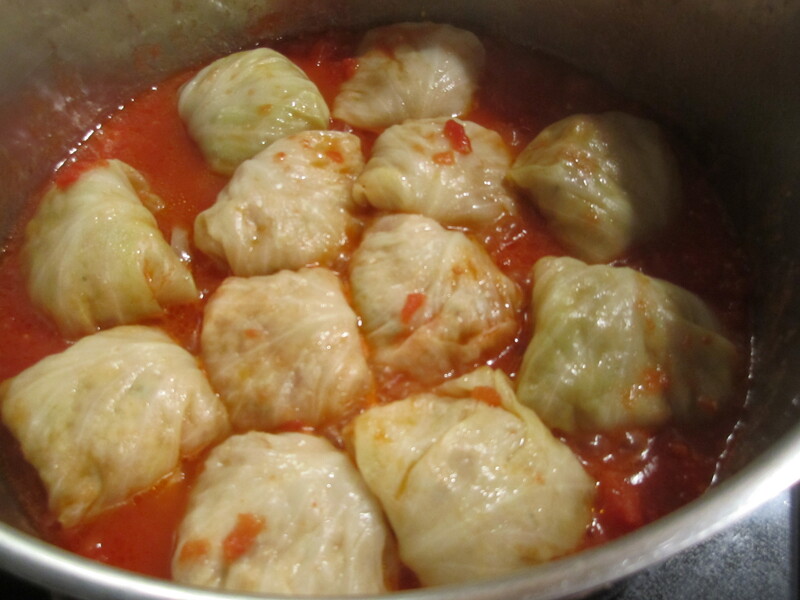 I had never made stuffed cabbage. My mother had made it, my mother-in-law had made it, my sister-in-law makes it. 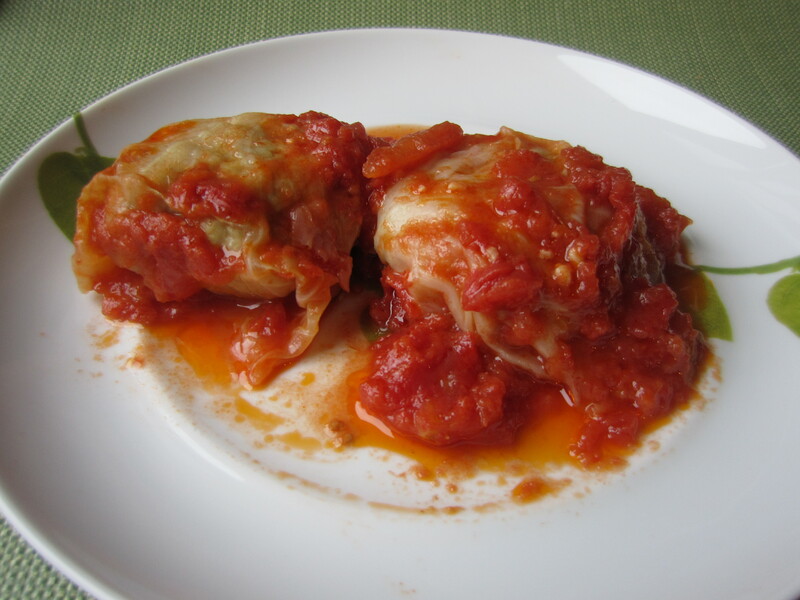 It never dawned on me to ever make it until I read Deb’s post on Italian Stuffed Cabbage and the fact that I had a cabbage in my refrigerator that never made it into My Mom’s Coleslaw. 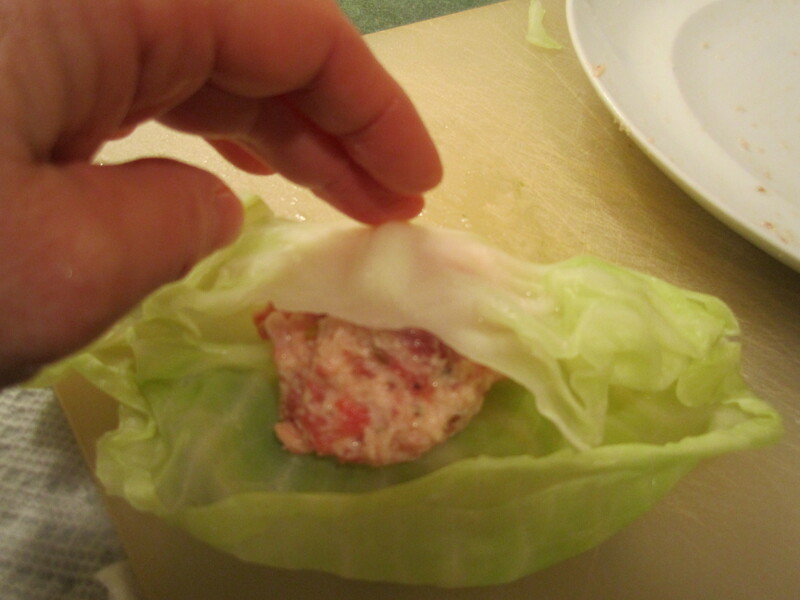 My only trepidation was that my husband had a very clear idea of what stuffed cabbage should taste like. Certainly something you don’t want to fool around with. But I decided to give it a try anyway and I am very glad I did. Bring a large (8 quart) saucepan of salted water to a boil. 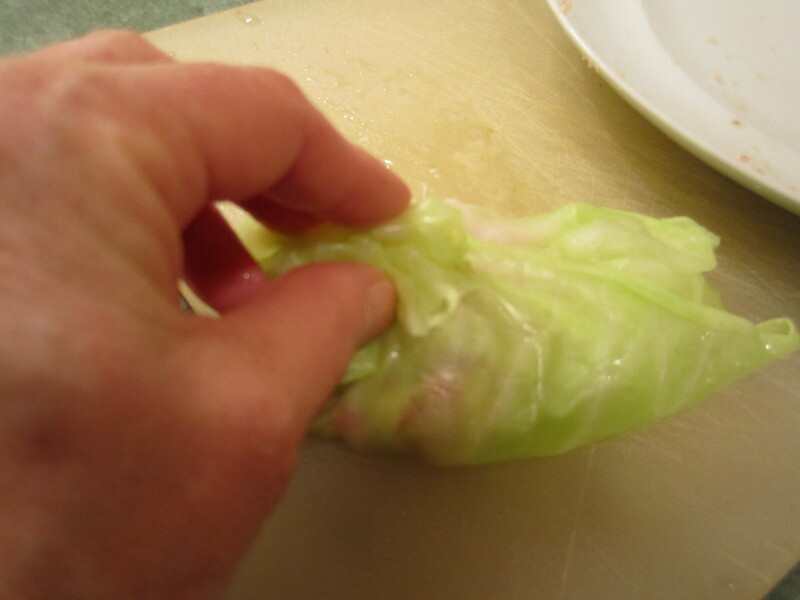 Take off any bad looking cabbage leaves and then carefully peel off 12 cabbage leaves. 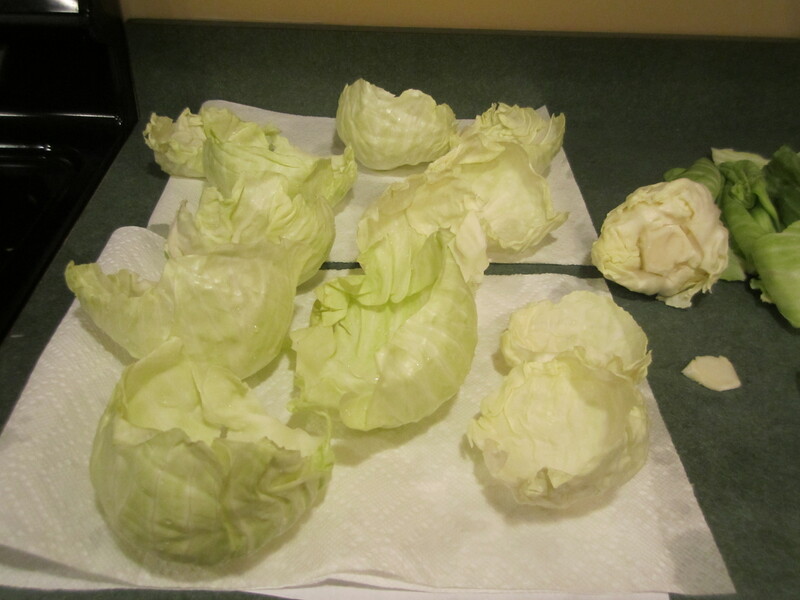 I had a small cabbage so that’s why I emphasized the size. I had a lot of trouble with this, I think because of the size. 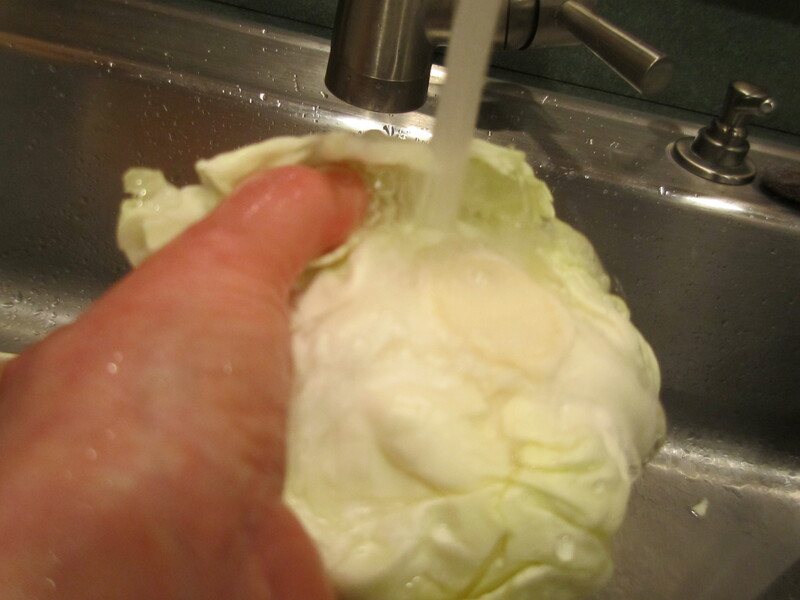 Finally, after a bit of trial and error, I took off as much of the stem end as possible and then put the cabbage under very warm running water. 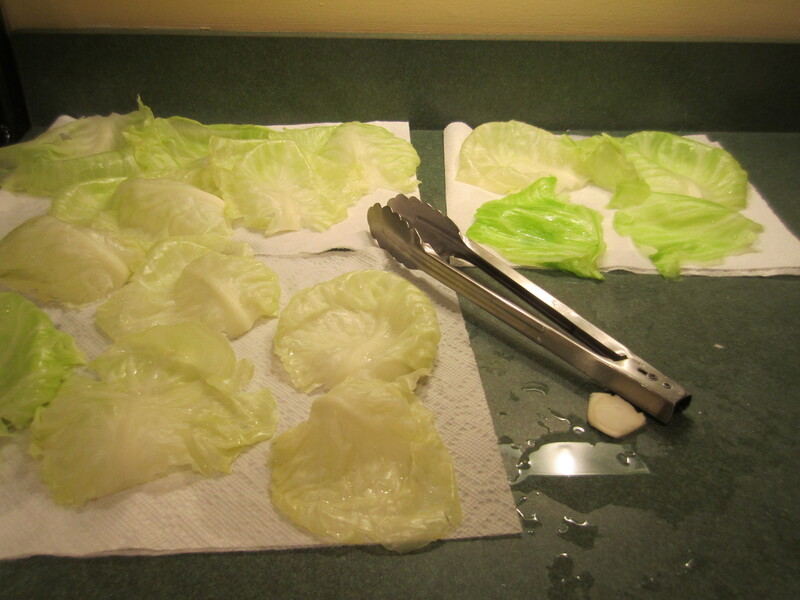 I used the water plus some gentle pressure, to take the leaves off. It worked but some of the leaves were very small. 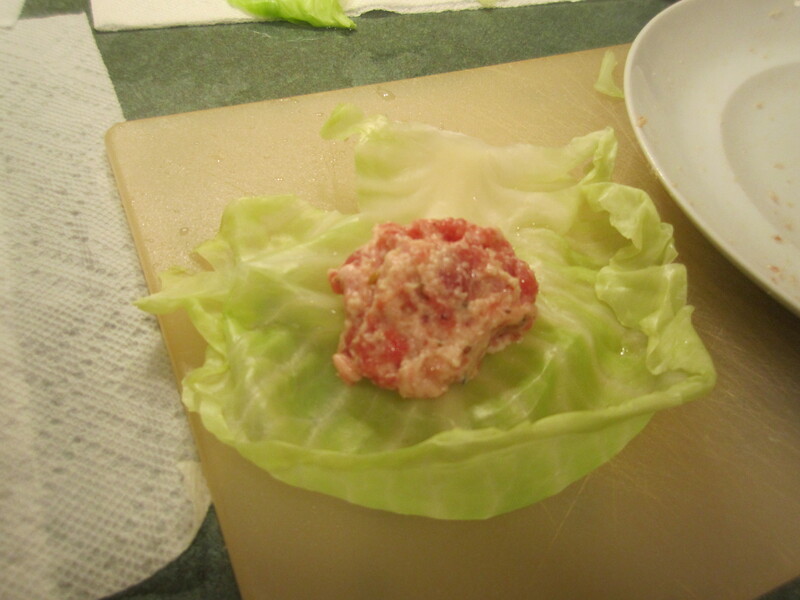 I ended up taking some broken blanched leaves and using those to help enclose the filling with the small leaves. But anyway, onward. 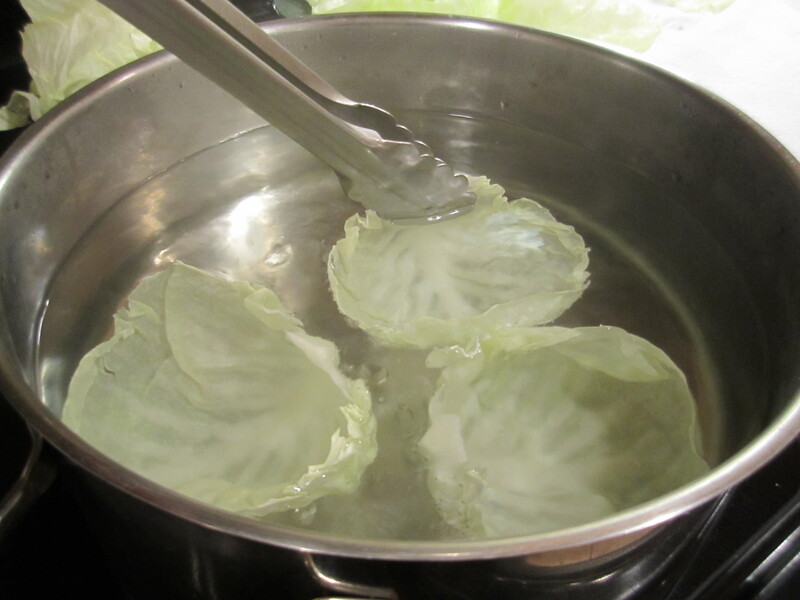 Blanch the leaves: the savoy per Deb take 30 seconds to 1 minute, the regular green cabbage leaves take 2 minutes, until wilted and remove with tongs onto paper towels. 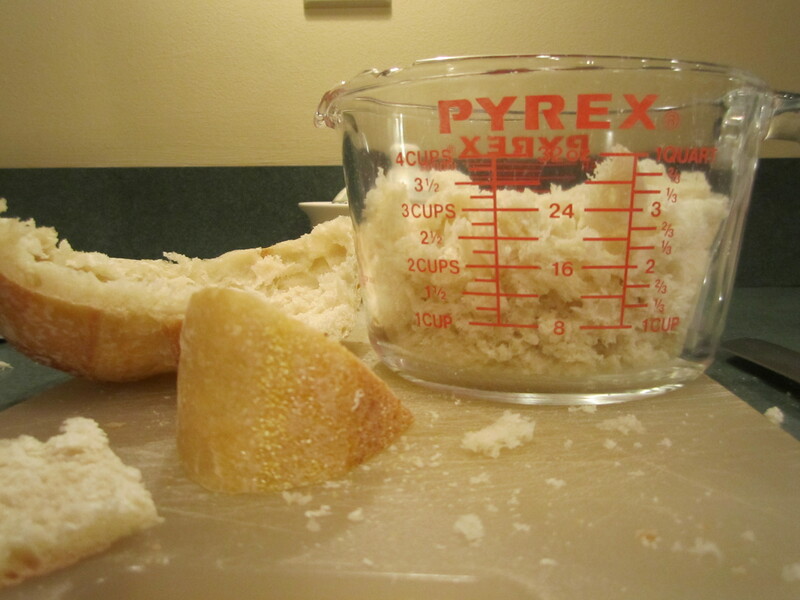 Take the insides out of the chunk of bread, making small bread crumbs. You should have about 3 cups. Place in a large bowl and add the milk. 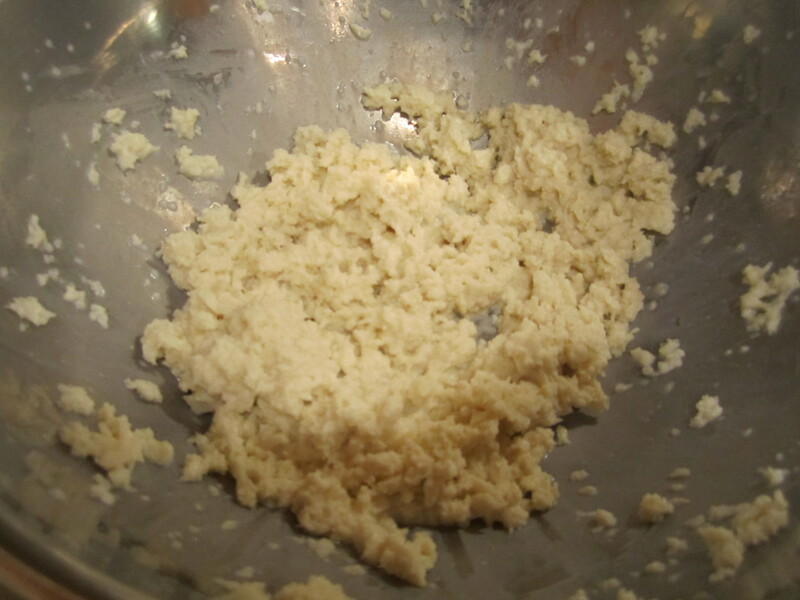 Let it sit while you get the other ingredients together, then mash with a fork until mushy. 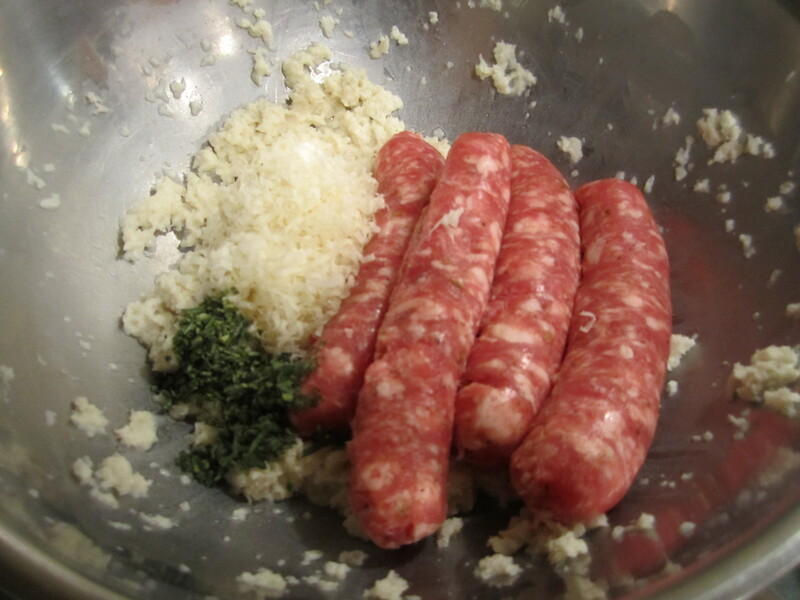 Add the sausage, very optional sage and rosemary (because of all the herbs in the italian sausage itself, next time I would not put in the extra herbs at all, as per Deb), parmesan cheese and mix with a large fork until combined. 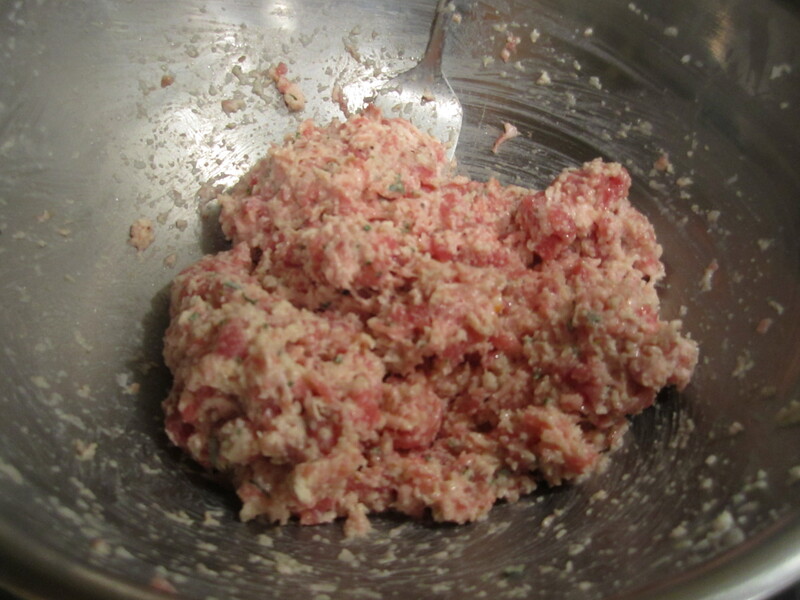 Using a 3 ounce ice cream scoop, make 12 balls of pork sausage mixture and place on a plate. 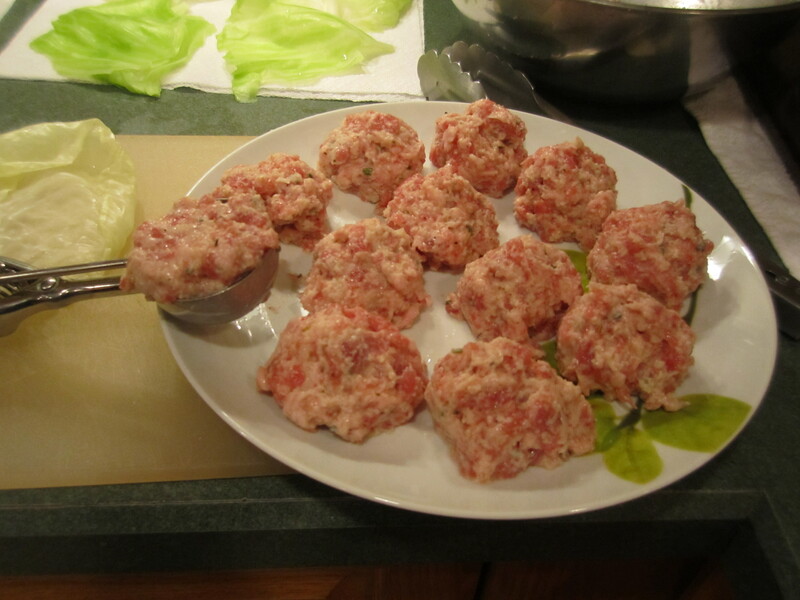 Take one of the cabbage leaves, place on a cutting board, and put one sausage ball in middle. 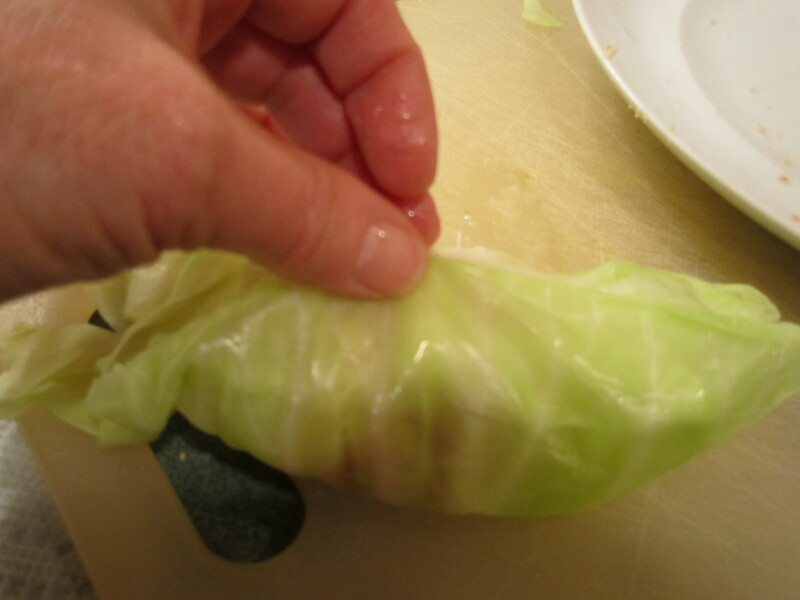 Fold the cabbage leaf around the sausage ball like you are wrapping a package and secure together with a toothpick poked down the middle, hopefully catching all the ends of the cabbage leaf to make a secure package. In a couple of instances I needed 2 toothpicks to make this happen but in the long run it worked. Don’t stress too much. Continue to do this with all the leaves and set aside on a cookie sheet. Heat olive oil in the same large, 8 quart saucepan (without the water, of course :)), over medium heat. Add the garlic and cook for about 30 seconds. 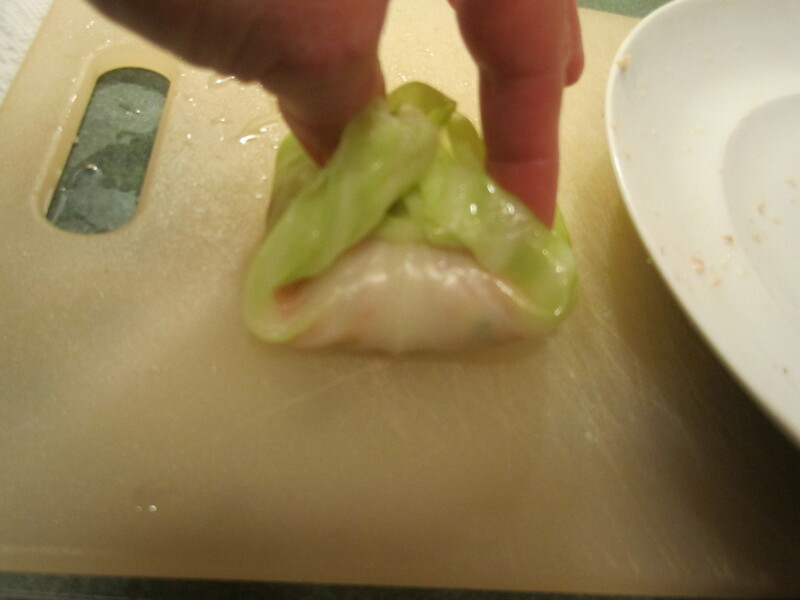 Add the tomatoes and chop them up using a Pasty Cutter/Blender (hey, another use!) into medium pieces. 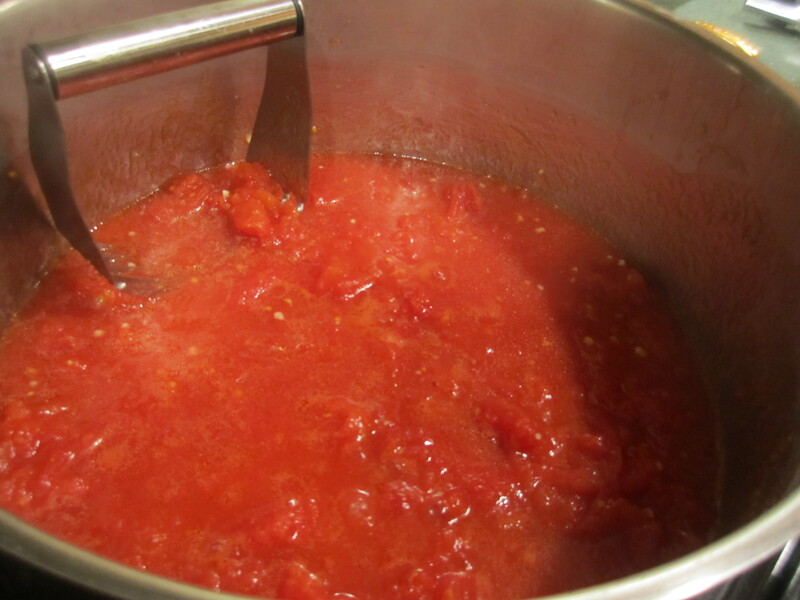 Bring the tomatoes to a simmer. 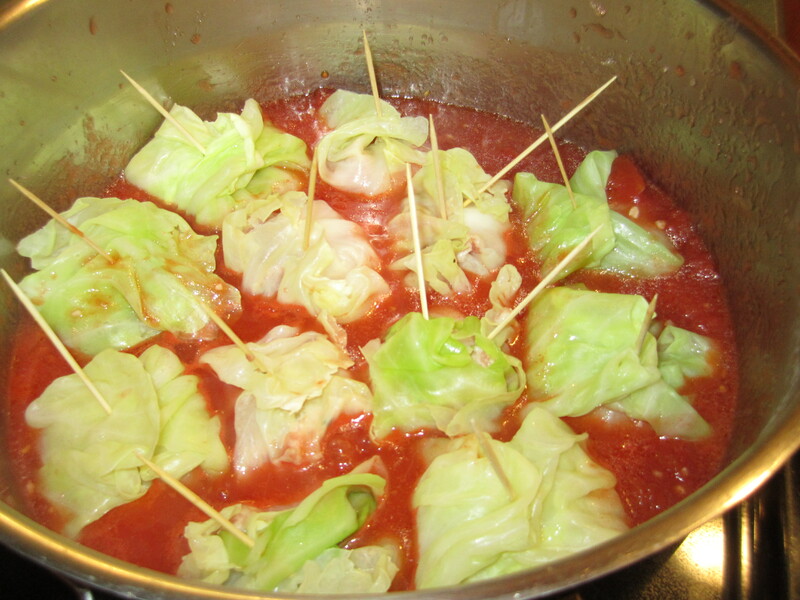 Add all the cabbage packages to the tomatoes, in one layer, cover pot and simmer for 25 minutes. 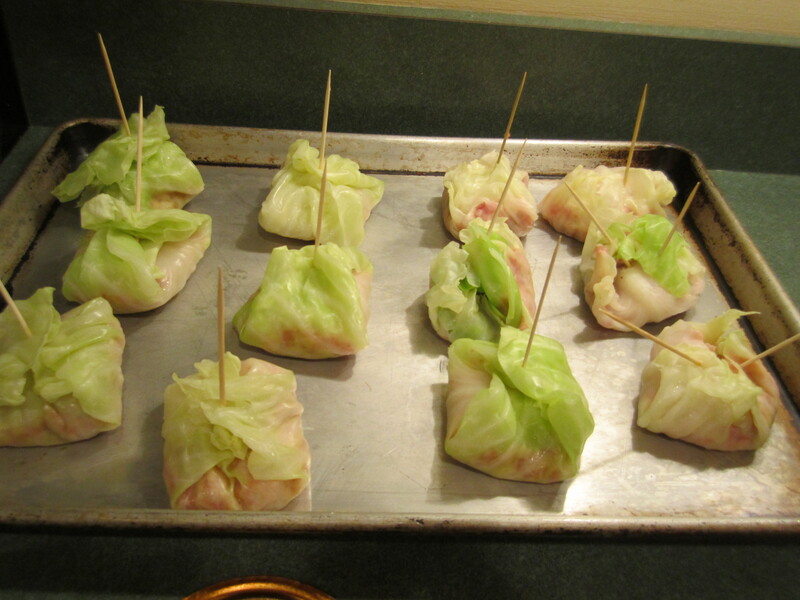 Remove the toothpicks and turn the cabbage packages over, cover the pot and simmer for another 25 minutes. Remove the lid and simmer for another 10 minutes. 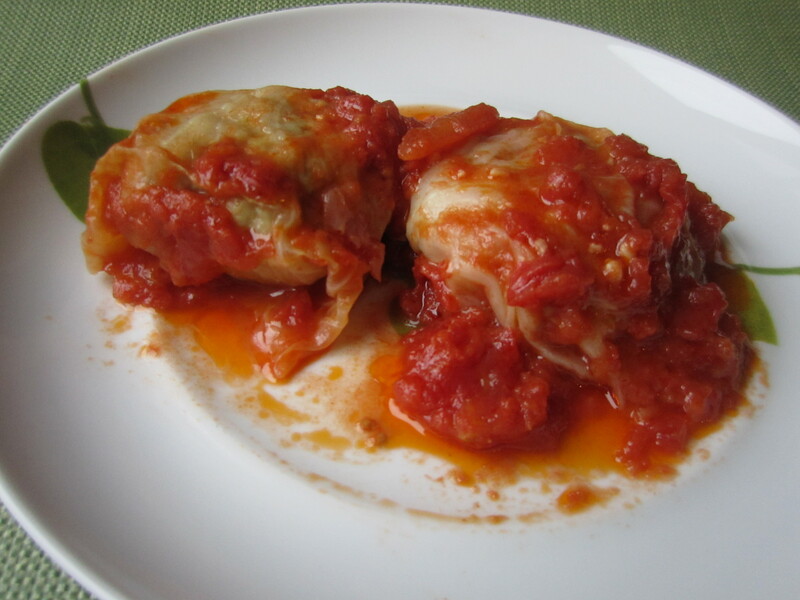 Serve the cabbage rolls with the tomato sauce. Yum! My husband had them for lunch the next day and said they tasted even better! Success!